Once, no doubt, the tales of gods and heroes were exciting, full-blooded affairs that held people on the edge of their rock, or stump, or whatever it was they were sitting on around the fire. But when I suggest that was "a long time ago," I mean that was a reeeeeaaaaaalllllly long time ago. My formal introduction to mythology was via the utterly bloodless and clinical Mythology by Edith Hamilton. I really wanted to know the stories because they are a common foothold and reference point for all of Western civilization, but man I could not read that book without falling asleep to save my life. I remember, however, flipping to the back of it at some point where the briefest of surveys of Norse Mythology could be found, reading through it, and thinking, "This sounds way better. Why didn't she write more about this stuff?" Neil Gaiman has attempted to put some of the blood, humor, and...frankly...just good storytelling back into these ancient tales. And he has succeeded. Just as a test, I told a pair of these version of the Norse myths to my kids around the dinner table just to see what happened, to see if there was any sense of an audience hanging on the edge of their seat to see what happened next or how this was going to go wrong (or right), and they definitely landed. I had a request the next day for more of them, in fact. I read Padraic Colum's Nordic Gods and Heroes years ago, and found it a little more engaging than Mythology, and thorough. Our intrepid Nerds of a Feather site founder The G blessed our family with a copy of D'Aulaires' Book of Norse Myths, which is possibly the gold standard in terms of modern books of these tales. Where Gaiman bests the D'Aulaires is in his inclusion of some of the more off-kilter details of the stories and the worlds of the gods and giants (such as bad poetry coming from the fart of an eagle), but also, Gaiman's is a brief book, and so huge swaths of the mythology familiar to me from Colum are sadly missing here. Men, even Sigurd, do not figure into Gaiman's telling. One of the joys of Norse myths is that not only does it have a beginning, like all mythologies, but it has an end in Ragnarok. Gaiman tells these tales with a focus on Loki, who will bring about Ragnarok. Thor is well represented, as his stories are probably the most fun (those, for instance, are the ones I told my kids), but I felt Odin got a bit of short shrift, or at least we spent too little time with him. Any god who conceives of sacrificing himself to himself for wisdom and understanding is someone I want to know more about, but I felt like much of the deception in these stories, and the reneging on vows and promises, probably would have weighed quite heavily on such an individual, and I thought it was an avenue that wanted more exploring. Frankly, despite Gaiman's tremendous efforts at shaping the arc of the mythos and zeroing in on a few core characters, there is yet something in these stories themselves that keeps them at an emotional arm's length, and I'm not sure it can be overcome. When Thor simply kills all the giants in a kingdom, any modern sensibility would abhor such a thing, so too the ways in which Freya is continually being offered up to marry monsters to satisfy a debt, but these things are simply baked into a group of tales that were first told over a thousand years ago. Nevertheless, Gaiman is a wonderful storyteller, and these stories are wonderfully told. The book is tremendous fun, the way you'd expect Neil Gaiman's tellings of Norse Mythology would be. 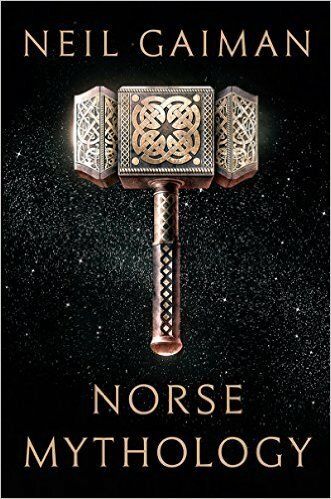 If this is your first spin through Asgard, or if you haven't been there in a while outside of Marvel movies, I recommend the book. Penalties: -1 for the dissonance between a fresh, modern telling of tales that include so much that is alien to modernity. One thing about those dry, scholarly re-tellings is it makes it easier to locate baked-in attitudes about gender, the value of human life, and similar things firmly in antiquity. Nerd Coefficient: 8/10, well worth your time and attention. More about our scoring system here. Posted by Vance K — co-editor and cult film reviewer for nerds of a feather, flock together since 2012, musician, and Emmy-winning producer.